In a TED Talk she gave in 2013 (which now has 3.8+ million views), pioneering psychologist Angela Duckworth presented her findings about the key to success. Through her work with cadets in the West Point Military Academy, participants in the National Spelling Bee, salespersons from private firms, teachers and students from public schools, and many more, she concluded that it’s not about IQ, talent, family income, or other factors. The most significant predictor of success is, in fact, grit. According to Duckworth, grit is the combination of passion and perseverance for long-term goals. It’s about working long and hard in pursuit of a higher purpose. It’s about fostering the growth mindset and rising after supposed failure. And it’s about following through even when the going gets tough. She then concluded her talk with how surprisingly little science knows about grit and how much work needs to be done. That was in 2013. Three years later, she published Grit: The Power of Passion and Perseverance to fill that gap and offer suggestions on how to grow grit in a practical and sustainable way. One of my favorite aspects about the book is that using numerous studies on psychology, sports, the military, management, and overall success, the author developed an actual test called the Grit Scale. It's "a test that, when taken honestly, measures the extent to which you approach life with grit" by measuring its two core components: passion and perseverance. If you have a copy of the book, I encourage you to take the test; a version of it is available on page 55. Since grit is more than just being resilient or hardworking, there's also an emphasis on working towards long-term goals. Some people might refer to this as your ultimate goal or your life's purpose, but Pete Carroll, head coach of the Seattle Seahawks and one of the people Duckworth interviewed for her book, calls it your life philosophy. To avoid having several small and incoherent goals, the author takes inspiration from Warren Buffet's 25-5 rule and suggests asking to what extent your goals serve a common purpose. To help with prioritizing, try identifying and classifying your goals as top-level goals, mid-level goals, and low-level goals, and making sure that your low-level goals serve your mid-level goals, and your mid-level goals ultimately contribute to your top-level goals. It's also important to note that talent is not enough, and effort actually counts twice in terms of achievement. According to the author, talent needs to be combined with effort in order for it to turn into skill. And skill needs to be combined with even more effort in order for it to become achievement. This is precisely the reason why many people, in spite of being extremely talented, still don't "make it." 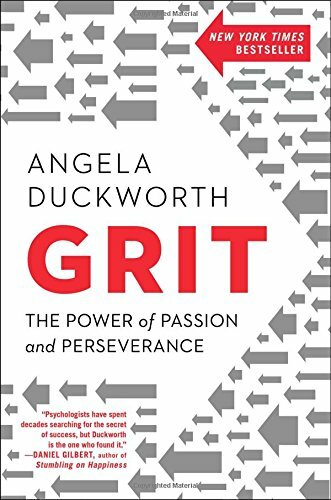 Similar to the findings of psychologist Carol Dweck on mindset, Duckworth emphasizes the ability of grit to grow, that it's not some fixed characteristic we're born with. You can do it two ways: from the inside out and from the outside in. In terms of growing grit from the inside out, she suggests concentrating on four psychological assets: interest, practice, purpose, and hope. While passion can be such a heavy-loaded word, one way to find it is to figure out what you're interested in. According to Duckworth, passion can be fostered but only by actively going through these stages: discovery, development, and deepening of your interests. Practice, or more specifically, deliberate practice, is also helpful in growing grit. Coined by cognitive psychologist Anders Ericsson, deliberate practice includes setting a clearly defined stretch goal, giving your full concentration and effort, seeking feedback to improve weaknesses, making it a habit through repetition and refinement, and getting an excellent coach, teacher, or mentor. According to the author, purpose is "the intention to contribute to the well-being of others" though it might not be evident right at the outset. While it starts out as a spark and even though you see others pursuing their purpose, this only turns into a purpose once there's a revelation—once you realize that there's a problem that needs solving, and that you are in a unique position to actually make a difference. Lastly, hope is the belief that through your efforts, tomorrow will be better than today. It's the realization that failure is not permanent, and that you are indeed capable of rising above it. To quote an old Japanese saying, "Fall seven, rise eight." To grow grit from the outside in, the author provides suggestions for parents, teachers or coaches, and for members of a culture/community. When it comes to parenting, there's a common debate between authoritarian parenting and permissive parenting but really, the focus should be on the children. Different children have different needs at different times and it's up to the parents to decide which approach is best. As a parent herself, the author proposes her own Hard Thing Rule for children to follow: do something that requires daily deliberate practice (preferably a structured extracurricular activity that builds character), remind them that you can quit but only when you've finished what you started, allow them to pick their "hard thing," and for high schoolers, stay at it for at least two years. For coaches and teachers, the same principle follows. It's crucial to teach kids to do hard things that interest them and to follow through even when it's tough. This ensures they live in an environment that values effort, discipline, growth, and learning. In terms of culture, it's about finding out what characteristics make the community, sports team, or organization unique. It's about saying, "This is how we do things around here and here's why” which eventually transforms into “This is how I do things around here and why.” If you want to be grittier, the author recommends finding a gritty culture and join it. Instead of IQ, talent, social skills, or other factors, the one crucial determinant of success is grit. While grit is the combination of passion and perseverance to pursue long-term goals, it's important to remember that this isn't a fixed characteristic. We can grow grit from the inside out by focusing on interest, practice, purpose, and hope, and from the outside in by creating an environment that values discipline, provides support, and encourages learning. Share in the comments below: What did you find most useful from this article/book? What are ways you intend to grow grit for yourself? 3 Takeaways from Mindset by Carol Dweck, Ph.D.